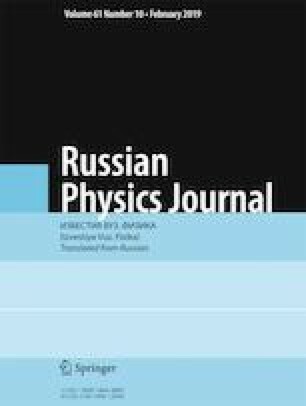 The influence of the temperature of implantation of Ni–Ti shape memory alloy with 84Kr15+ions at the energy E = 147 MeV on its structural-phase state is investigated. At the implantation temperatures 250 and 300°С, within the projective range Rp and out-range area the following processes and phenomena are observed: new formation of the martensitic В19'-phase, formation of nano-sized particles of the R-phase, increase in resistivity due to the formation of radiation-defect structures, strengthening of the alloy in the austenitic structural-phase state, and longer phase-transition temperature intervals. Translated from Izvestiya Vysshikh Uchebnykh Zavedenii, Fizika, No. 11, pp. 62–67, November, 2018.